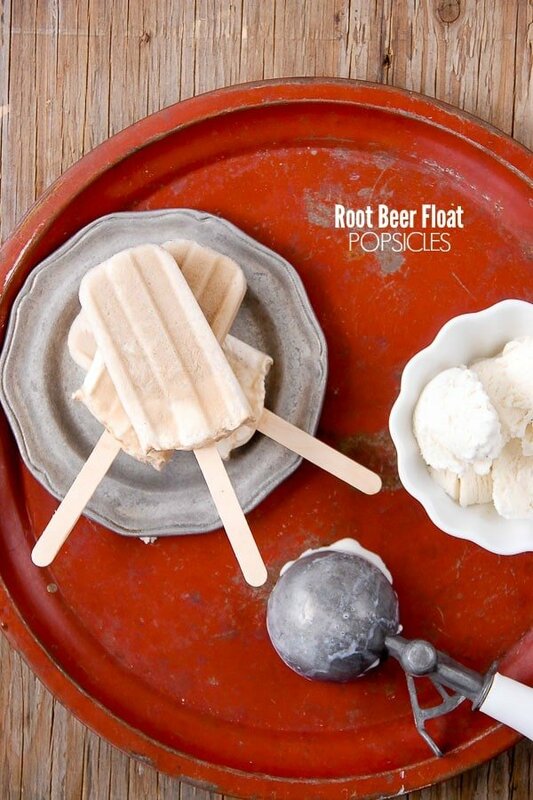 If you love root beer floats, you’ll be over the moon for these Root Beer Float Popsicles! An easy two-ingredient treat could not be easier to make (or more delicious to eat)! With Fourth of July heading our way next week, my food fancying has turned toward all things Americana. I love to take pause to consider the roots of some of our better loved dishes and the happenstances that occurred giving birth to them, very often without intent. 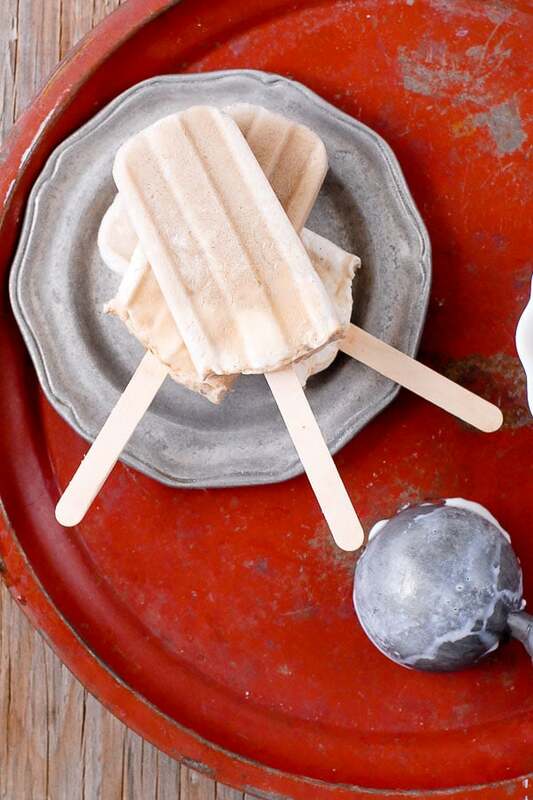 No one said classic dishes can’t take on a new form and after trying these Root Beer Float Popsicles I am sure you’ll agree! 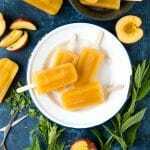 Simple to make with the two key ingredients, vanilla ice cream and Root Beer, these popsicles are a cool, sweet way to enjoy the iconic float in a new form. Is there anything more summer-classic than the Root Beer float? It tastes like summer. I don’t remember my first Root Beer Float exactly however by my childhood overlapped with the popular A & W Root Beer Drive-Ins where one could drive up, and park in a row of cars where a waitress (they were called that then) would walk or roller skate to your car, take your order and return with frosty mugs of root beer and food on a tray that was neatly attached to the driver’s window. There was nothing like an ice cold mug of root beer on a hot summer’s day. The history of the Root Beer Float is a bit less clear though most claims point toward Frank J. Wisner in 1893. I’ve read he owned a soda fountain and one day his ice cream machine broke so he added cold soda as a means to keep the ice cream cool, thus inventing the Root Beer float. A more beguiling tale is that he was a resident in Cripple Creek Colorado during its mining heyday (as were my maternal grandfather’s family), owned a mine and also whipped up interesting soda-based drinks for local citizens of Cripple Creek. The story goes to say he had a vision one evening viewing the local snow capped peaks in the moonlight which looked like a dollop of vanilla ice cream in a dark drink. This gave way to the ‘Black Cow’ (or ‘Brown Cow’) drink that was essentially a modern day root beer float which delighted the local children. These tales are all merely heresy but regardless of the true beginning of the famous float it harkens back to the old school soda fountain with a strong foothold in the history of American cuisine. 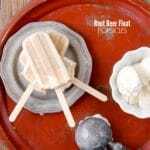 To celebrate summer and the Root Beer float I made Root Beer Float Popsicles! 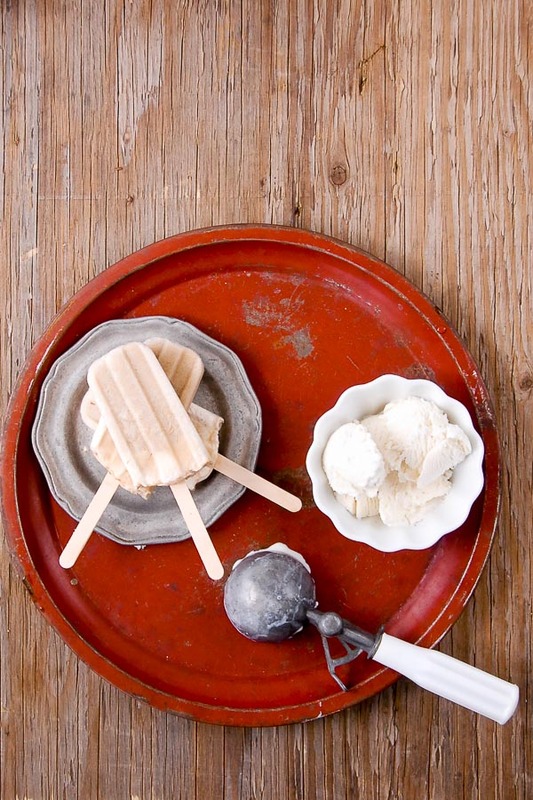 Simple with the two key ingredients, vanilla ice cream and Root Beer, these popsicles are a cool, sweet way to enjoy the iconic float in a new form. 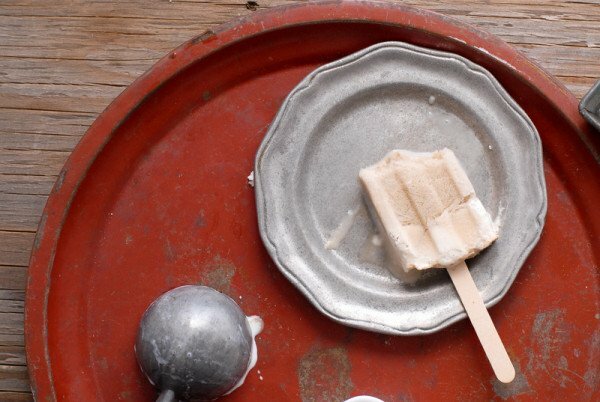 Root beer float popsicles allow enjoyment of the quintessential summer favorite in a new, fun form. 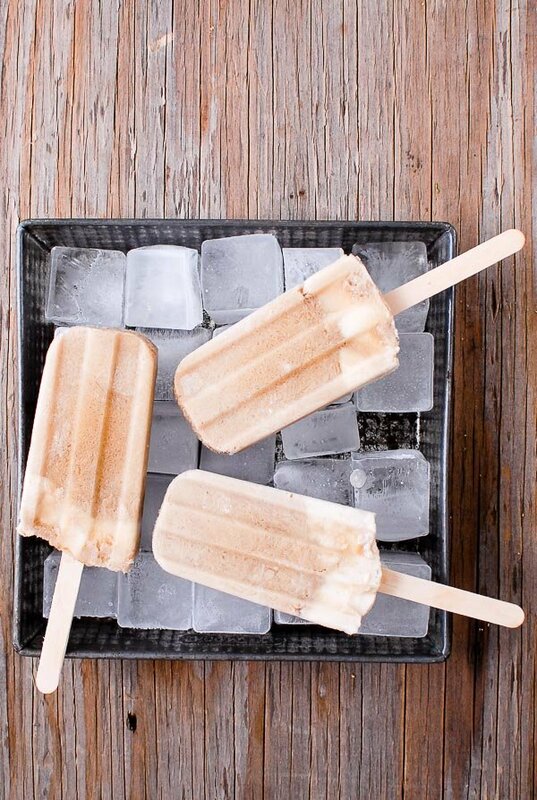 Pour a small amount of the root beer into each popsicle mold (equivalent of aproximately 3/4 inch in the mold). Evenly distribute the ice cream between the popsicle molds in spoonfuls. Pour root beer into molds in small amounts allowing the foam to die back before pouring more to fill molds to the top. Cover with lid of popsicle molds. Place an sheet of foil on top of the popsicle mold top and insert sticks (the foil keeps the sticks in place so they don't slip into the mold more than desired or float). Freeze until fully frozen. 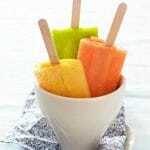 To remove popsicles run molds until hot water for a few seconds and remove. Oh good Katie! They taste like summer to me! I just bought a popsicle mold about a week ago, so I’m very happy to have come across this recipe. I have 2 small cans of root beer waiting to be used up… I’d rather make a root beer float popsicle than just drink the beverage! OMG! I haven’t visited in sooo long and this is such a nice way to come back to Boulder! Root beer and ice cream remind me of A&W root beer floats … a total blast from the past … but these pops are a much easier way to go! Nice to see you again,Toni! Love the idea of this! Root beer floats (my family always called them black cows – others prefer brown cows) always scream summer to me. 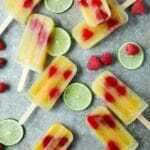 I’ve never made popsicles, though – definitely something I need to try! Great idea (and post!) – thanks. You know John I had never heard the Black or Brown Cow term until researching for this post. It seems the true origins of the float or the name will not be known for certain but I think we all agree about these tasting like ‘summer’. I won’t lie: I’ve become a bit obsesses with making popsicles this summer, many of the boozy nature. 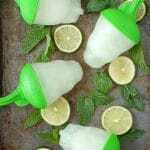 They are fun, cooling and certainly not just for kids anymore! Thanks much for stopping by! 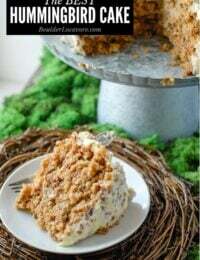 These look so yummy and so easy! They completely are both of those things! That’s so funny about your cravings Katrina! I craved completely different things (beef with my first and tangy-vinegary things with my second); I’ve always wondered what one’s pregnant system is needing to produce such cravings. Pregnant or not these are yummy!